This is the last of the rolls that we made from Mobo Sushi. (There may be more later, but this is the last of them for now. 😉 ) We thought this one was pretty good. A nice gari flavor, but don’t use too much or it will overwhelm the sushi! I know there are those of you out there who are huge gari lovers… this one is definitely for you. Slice each piece of gari in half. Cut the smoked salmon into 6 slices. 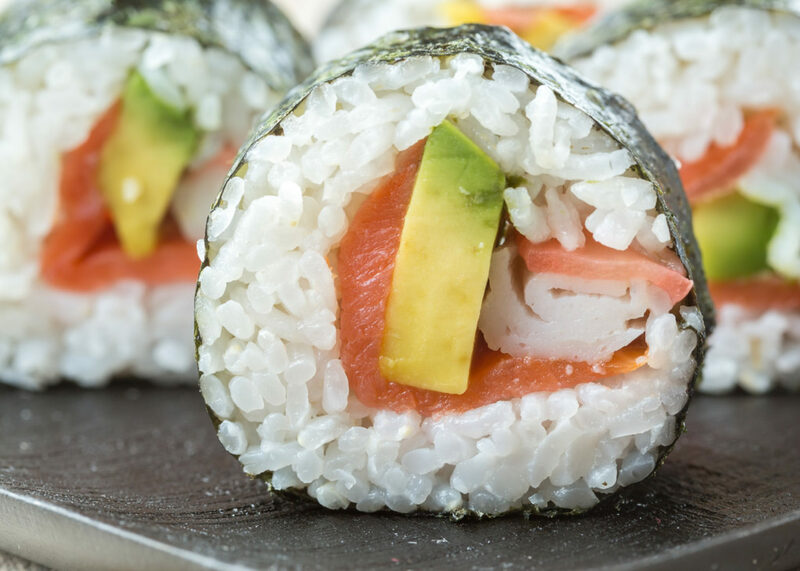 Roll the sushi, using avocado, imitation crab, 5 slices gari, and 1 oz smoked salmon as your fillings. MMM, using ginger a as filling is a good idea. I will have to try this! Hey Allison- I know you already ordered, but that’s why I was asking about Cafe Press- though I’ve yet to buy something from them, they handle it all; the inventory isn’t made until someone orders it, and they take care of payment, shipping/handling, etc. Did you look into Google Checkout? I seem to recall their fees being much lower than PayPal and some sort of cheapie promotion until January. There’s also Yahoo Shopping Cart but I think theirs is more than PayPal but definitely more than Google. Just a suggestion. I don’t mind sending you a check, though it makes me nervous on the point of… well, a live check in the mail seems dangerous (um… to anyone older than me or less technologically inclined than I reading this, I have always paid my bills online; writing checks is something I really really don’t like). Jen – Yeah… it’s a pretty interesting roll! Hehe silly… you didn’t forget to tell me… didn’t you already post something on Inari Zushi about it? 😛 Besides.. I always read Feisty Bento, so I definitely saw it. Thank you! 😀 Isn’t inari sushi wonderful? Allison I just made this roll today and I must say it wasn’t anything like I thought it would be, it was soooooo much better. The ginger gave it a special kind of twist. I will be making this one again. I also made 3 other different rolls from your web page. This is the first time I ever ran out of rice. I just wanted to keep on making more. I’ve alwaysjust made sushi out of fish, never thinking of all the different things you are putting in them. Thank you so much for taking time out of your life and keeping up this page. Hehe yeah it is surprisingly good! Especially if you like the taste of ginger. I’m so glad to hear that you liked the sushi so much that you didn’t want to stop! It’s always my pleasure to keep up Sushi Day and bring you plenty of sushi recipes!